Enjoy an incredible aerial view of the Arizona desert on this small-group helicopter tour from Page. Spend 20 minutes in the sky, flying above Antelope Canyon, a slot canyon located on Navajo land east of Page; Lake Powell, a reservoir on the Colorado River along the border between Utah and Arizona; and the Grand Staircase, an enormous sequence of sedimentary rock layers. Also, spend 20 minutes on top of Tower Butte for a breathtaking panoramic view some 5,000 feet above sea level. This aerial tour, limited to six people, lifts off from Page Municipal Airport in a state-of-the-art EcoStar helicopter. Begin by flying east over Antelope Canyon on Navajo land. Antelope Canyon includes two separate slot canyon sections, referred to individually as Upper Antelope Canyon and Antelope Canyon — or the Crack and the Corkscrew, respectively. Also, see Lake Powell, a reservoir on the Colorado River that sits along the border between Utah and Arizona. It is the second largest man-made reservoir in the United States and a popular tourist destination. And the Grand Staircase, an enormous sequence of sedimentary rock layers. Finally, land on top of Tower Butte, one of Mother Nature’s most unique rock formations, for 20 minutes of unparalleled sightseeing. The panoramic view from here is simply breathtaking. See all the aforementioned sites plus Glen Canyon, the Kaiparowitz Plateau and the Vermillion Cliffs. Bring a camera to capture the incredible views while learning about Navajo history and culture from the pilot/guide. The tour concludes with a return trip to the airport in Page. Our pilot was named Dusty. We have to give him the highest marks. The flight was smooth and informative. The time spent on Tower Butte was amazing - it left us almost speechless! We also found the staff at Grand Canyon Airlines incredibly helpful we mean you, Angie!!! Fantastic experience all around! super expérience. Mais l'hélicoptère reste évidemment un moyen de survoler assez onéreux. En fait on voudrait que cela dure un peu plus longtemps . 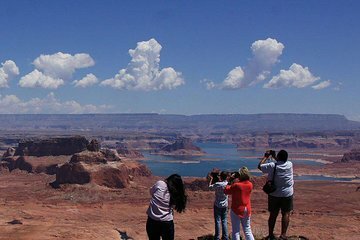 Survol très impressionnant au dessus du lac Powell, personnels et pilote vraiment très sympatique et très ouvert à nos attentes. Je recommande à 100%!!! !